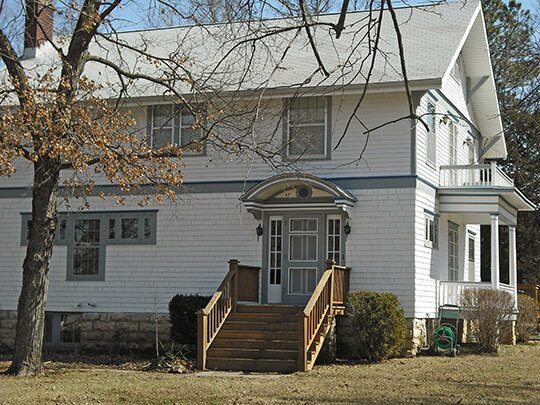 Baldwin City Hall is located at 803 8th Street, Baldwin, KS 66006; phone: 785-594-6427. Photo: Dream Haven (William Quayle House), ca. 1890, 210 North 6th Street, Baldwin, Kansas. Listed on the National Register of Historic Places in 1995. Photographed by User:Bhall87 (own work), 2009, [cc-by-3.0 (creativecommons.org/licenses/by/3.0)], via Wikimedia Commons, accessed July, 2015. Palmyra Township was surveyed in 1857. Businesses catered to the Santa Fe Trail traffic (wagon, harness, blacksmith shops, post office and hotel). Elementary education was extremely important and higher education became a priority. Money was provided to buy land south of the township to be given to the Methodist Episcopal Church if they would start a college nearby. The Methodist Church accepted and named the college Baker University after Bishop Baker. Baker University, a small private liberal arts university, was established in 1858 along the Santa Fe Trail and is the oldest university in Kansas. Baker's three schools serve more than 2,000 students at various campuses: the College of Arts and Sciences at the main Baldwin campus, the School of Nursing at Stormont-Vail Regional Health Center in Topeka, and the School of Professional and Graduate Studies in Overland Park, Topeka, Wichita, and Lee's Summit, Missouri. Three of Baker's buildings are listed on the National Historical Register: Old Castle Museum, Case Hall, and Parmenter Hall. Pulliam Hall is listed on the Methodist Register. The Old Castle Complex consists of a museum, a cabin and a post office. The Kibbee cabin and Palmyra Post Office are reproductions of originals that related to Baker's history. To further the plan, Palmyra wrote John Baldwin of Berea, Ohio, a wealthy farmer and owner of grist and saw mills and a believer in higher education. Palmyra requested he bring the mills to the new town site where business was prospering and in return, the new town would bare his name, thus Baldwin City was founded (1870). Gradually, the businesses in Palmyra moved to the new town site, and gave way to Baldwin City's prosperity. Baldwin City now incorporates Palmyra north of Highway 56, and Media (1906), around the old Santa Fe train depot. Landplan Engineering, PA and Phillips & Associates, Comprehensive Plan, Baldwin, Kansas, 2008, www.baldwincity.org, accessed July, 2015.